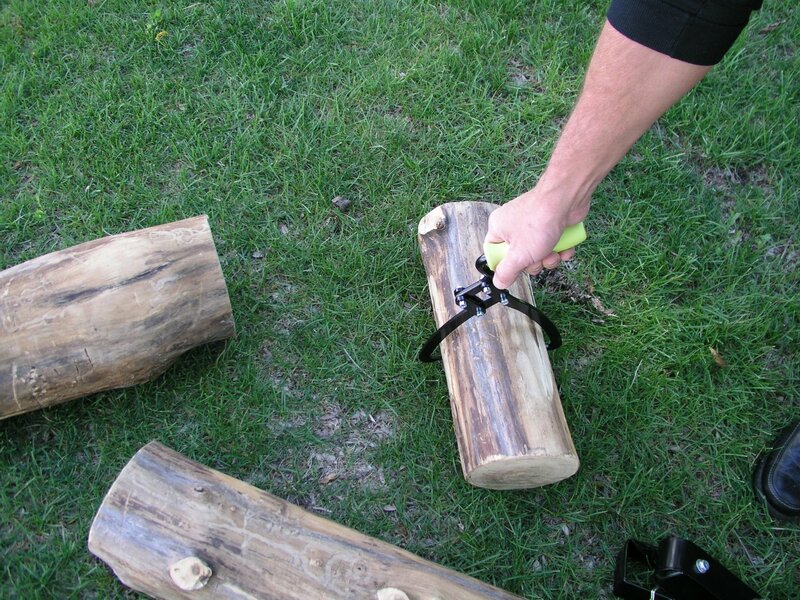 Using Timber Tuff log tongs can be a great way to carry firewood without putting strain on your lower back. Let's face it, after a full day of picking up firewood off the ground your lower back is going to get sore. Plus, if you're lifting with your back and not your legs, you increase the chances of a serious back injury. Back injuries can happen to anyone at anytime. Plus, after years of improper lifting, you're only increasing the odds of it happening to you. A close friend of mine is awaiting surgery right now due to picking up firewood and causing a buldged disk in his back. Now, instead of preparing to cut firewood in the spring, he's already looking for a place to buy it because he's not going to be able to cut any wood while he recovers from surgery. 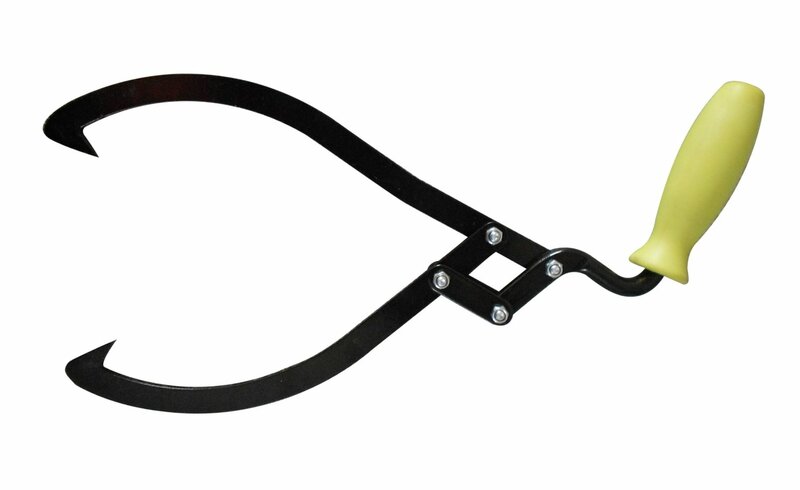 So, to help reduce strain on your back and to make picking up firewood a little easier, consider purchasing a pair of log tongs made by Timer Tuff. To learn more let's take a closer look at what this product has to offer. Timber Tuff log tongs are available in 2 different models, the TMW-40 which is made for smaller logs and the TMW-41 which is made for larger logs up to 16 inches in diameter. Both models feature a strong and sturdy design and have an offset handle to make moving the wood more comfortable. Using a pair of log tongs can have several advantages. 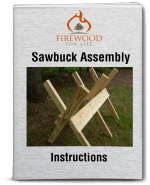 First, they allow you to pick up a log off the ground without bending all the way over which really saves your back. Plus, the ends stick firmly into the log preventing unwanted log slippage, but a quick flick of the wrist will allow the log to easily disengage and fall where ever you want it. Second, they work great for saving your hands in the snow. If you've cut firewood in the snow, you know it doesn't take long for your gloves to get cold and wet. By using log tongs you don't have to touch the wet snow and ice, keeping your hands dry and comfortable. Third, you can use the tongs to pick up or drag logs from a pile that's been sitting in the woods or weeds. Over time, a log pile that's been sitting in the woods will become a great place for snakes, spiders and other animals to call home. By using just your hands you don't have a buffer between yourself and a biting spider or animal hiding inside the pile. I've personally picked up a log from a pile and found a nest of black widow spiders living underneath. Plus, I've had mice literally run up my pant leg when I was standing in a pile of old wood tossing it into my truck. In both scenarios, a pair of log tongs would have given my hands and body a "buffer zone" between myself and the insects or rodents. "These tongs are a big back saver for me. When I drop a tree, I cut the larger part into firewood size lengths, until I reach the 8"-10" diameter size. Then I cut the wood into 4 foot lengths. These log tongs make is possible to move and gather the cut wood one handed by reaching barely below my knees, a real back saver. The tongs make it possible to walk with the wood in a natural motion, not held out in front of me, straining my lower back. I now cut the larger pieces 15" long so I can use the tongs across the length of the pieces and I can move anything that's not too heavy to pick up." If you're considering a set of tongs, think about purchasing two. By using one in each hand it helps even out the load and keep your body from leaning to one side when carrying a heavy log. Whether you move a lot of firewood or just a little bit, tongs have a lot of benefits. From reducing strain on your lower back to preventing a snake or spider bite, they're a low cost safety tool that shouldn't be overlooked.